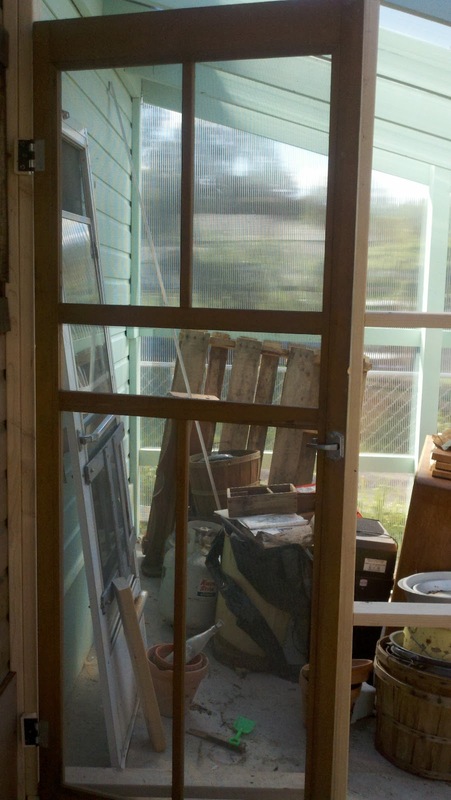 This is my greenhouse door. It is an old screen door that we saved from my in-laws when it was replaced. 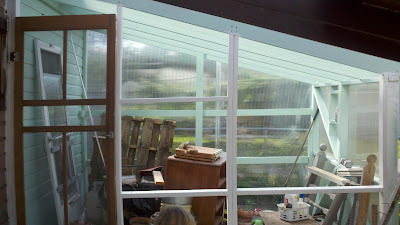 Eventually it will have removable greenhouse panels on the back side. By dilemma is whether or not to paint it and if I do paint it, what color. I like the natural wood but I'm also all about color. The frame of the greenhouse is a color that I coined Frugal Gardener Green because it was color matched and blended to a color that I finally agreed to. You can see the color here. So what do you think? Should I paint is or leave it natural? It's hard to tell without a live view, but I favor painting it. I also like natural wood, but I think a shade of red would go well with the minty green of the frame and give the whole thing some added visual interest. And there's always a crisp white. You can't go wrong with that, except it would show dirt, which is always an issue in the garden. Good luck! The greenhouse looks terrific.